Albert was proud to be wearing his “city clothes”. As the youngest of seven children, he rarely wore anything other than hand‑me‑down clothing. Thanks to his sisters’ sewing, every stitch he wore today was brand new. He was especially proud of his shoes, even if they had belonged to his older brother. Back home on the farm they didn’t wear shoes much. Most of Albert’s time was spent out in the cotton fields helping the older kids and his Papa. Sharecropping didn’t pay much, and everyone had to help as best they could. Today was a special occasion to Albert, as they were all dressed up to go to the town market with Ma Dear to help her carry back supplies for the winter. Albert had spent 45 minutes spit shining his shoes to as close to perfect as they could be. As he walked down the sidewalk, he felt proud at how the black leather lace-up shoes shone in the bright sunlight. If he held his foot a certain way he could almost blind himself with the sun’s reflection, or so he imagined. Albert was so caught up in admiring his shoes that he did not hear an old colored man on the corner mumble, “White folks comin’”. Albert vaguely heard footsteps falling on the sidewalk behind him, but made no move to step into the dusty street. He was lost in a world of sun and shine. Just two seconds before the footsteps were upon him, his brother Elbert reached out a skinny arm and yanked Albert from the sidewalk to the bare ground that served as the town’s main street. In his surprise, Albert lost balance and landed on his hands and knees. He glared at his brother who was standing with his sisters and mother, eyes downcast as two white women in expensive dresses and a boy of Albert’s age hurried past. Slowly, Albert’s family moved back onto the sidewalk. At his age, Albert did not understand this strange rule about moving off the sidewalk to let white folks pass. He thought it should be everyone’s sidewalk to use as they needed. But he knew enough to know that there were harsh penalties for breaking the rules. He didn’t know what lynching was, but it sounded plenty worse than Papa’s switch, and the switch was bad enough. Albert stood up and dusted himself off. He looked down at his shoes, now dust-streaked, and slowly, like a drop of dew releasing from the edge of a leaf, a single tear fell on the once-shiny leather. If my father was alive today and you asked how he identified racially, he would say “Black”. He was born in 1939 to a family of sharecroppers in rural Arkansas. 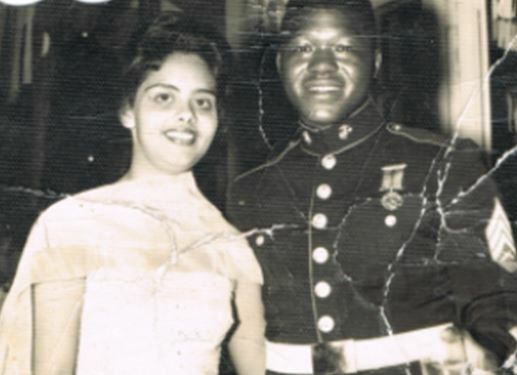 Just a few years before the summer of the Mississippi Freedom Riders, my father joined the US Marines and asked to be sent as far away as possible from the atrocities he faced as a young Black man in the segregated South. It was the late 1950s and de-segregation meant different things to different people. Thanks to high school typing classes and a natural ability to pick up languages quickly, he received an administrative specialty, was taught to speak Russian and Mandarin fluently, and was assigned to US embassy duty in Rangoon, Burma. My mother was born in 1937 in Rangoon. If you ask her today what her race is, she might say something like “Well, you know… they used to call us Eurasians, but now they would call us “Anglo”. I am still working to understand who “they” are, and the implications around it. The term “Anglo” is short for “Anglo-Burmese”. It’s a convenient yet limiting abbreviation, and in my mother’s case it concisely encompasses the lengthy European-based specifics of her cultural, ethnic, and racial heritage, which is more accurately described as Irish-Scotch-French-Portuguese, and Catholic. Some of her European roots came from missionaries who traveled to Burma to open schools and create converts, and then stayed and settled with Burmese wives. Some of her ancestors were soldiers with loyalties to the British Army who took foreign assignments in Burma. Having been born and raised in Rangoon (except for a brief exodus to India during WWII) my mother grew up in an environment of British colonialism. During my mother’s young adult years in post-war, post-colonial Burma, “Anglo” became synonymous with “unwelcome”. Similar to my father, she also had a talent for typing and languages, and took a job as a bilingual secretary working for the US Department of Defense at the US embassy in Rangoon, where she met my father in early 1961. Leave your reply at the bottom of this page…looking forward to reading your origin story!